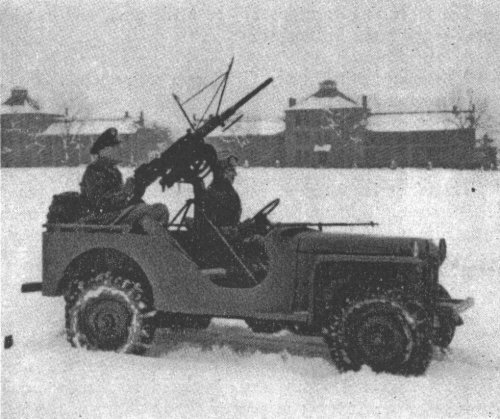 Bantam quarter-ton car used as prime mover for antitank gun and as mount for .50 caliber machine gun. 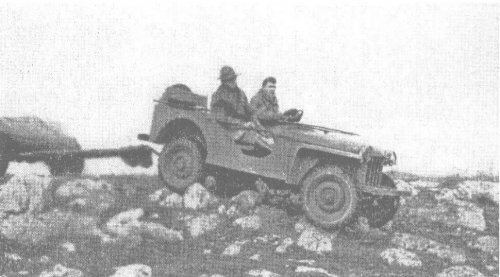 The Jeep taking off on a long cross-country flight. It has not yet been tested as a “flying OP.” by Captain George Ruhlen, 3d FA (from Field Artillery Journal, June 1941) The Bantam quarter-ton truck was tested informally at Fort Riley to determine if this vehicle could be used as a liaison car for artillery with cavalry; as a prime movcr for the 37-mm. antitank gun; and as a mount for the .50 caliber machine gun. The purpose of the test was not to usurp the functions of the Field Artillery Board or other regular agencies, but to arouse interest so that more exacting tests by competent agencies might be con- sidered. CHARACTERISTICS OF VEHICLE Vehicle – Weight, 2,700 pounds with load. Body – By Bantam (new ones by Ford) Motor – 45 horse-power, Continental Drive – 4 wheel (front wheels can be thrown out at any time) Tires – 6.00-16 Speeds – 6 forward, 2 reverse has transfer case, hi-low range can be thrown in or out at any time) Gas tank capacity – About 12 gallons Road clearance – 934 inches TEST WITH 4-MAN LOAD AND EQUIPMENT Vehicle was tested on firm ground, mud, snow, ice, and 10 inches of sand over all types of terrain. Perform- ance highly satisfactory. On one or two occasions the cars accompanied a Sunday hunt, and had no difficulty in keeping up with the field. For liaison purposes with cavalry, a 4-man detail, or 3 men with radio could easily maintain contact with any horse regiment, and also be able to accompany the Regimental Commanding Officer, if the latter chose to move in his command car. Grades up to 75% were negotiated. The vehicle never failed for lack of power. It was always because of lack of traction. Greatest obstacle was frozen ground which had thawed to a depth of ¼ to 1 inch. The mud, a viscous gumbo, was sufficient to fill the grooves between the chevrons on the tire and yet not soft enough to allow the wheel to sink in and make contact with the side walls of the tires. Chains aided, but did not completely prevent the vehicle from slipping on steep slopes. Speeds of 40 to 50 miles per hour across rolling prairies were easily obtained. On descents, the low-low gear ratio was sufficient to brake the vehicle alone on the steepest (85%) descent. Note height of spades with this style lunette. Overall height of vehicle is low. 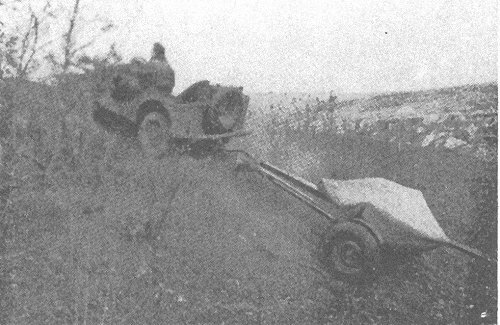 TEST AS PRIME MOVER FOR ANTITANK GUN With 3 men and towed load of 37-mm. antitank gun (weight 945 pounds) Same terrain was covered as above. There was little difference noted owing to the towed load, except over shell holes and redoubts, when the sudden pulling and pushing of the gun as it went in and out of shell holes could be felt in the vehicle. A gooseneck lunette was first used in an effort to raise the trail spades of the piece. This design proved faulty, inasmuch as the lunette straightened after several days of cross-country work and, in addition, when negotiating drop-oils or crossing ditches, the draft reaction on the spades was such as to cause them to dig into the ground like a plow and so hinder the passage. Another lunette was devised and with this design no diflculty was encountered on any of the test runs made by either the 3rd Field Artillery Battalion or the 6th Reconnaissance Squadron (who also conducted extensive tests using this vehicle as a prime mover for the 37-mm. antitank gun). The Jeep can squeeze between trees. MISCELLANEOUS FINDINGS Gas consumption on both long and short trips on roads and trails was about 30 to 34 miles per gallon. Cross country and over difficult terrain this dropped to about 27 miles per gallon. When run with other vehicles in a column no column elongation was noted. The vehicle has a quicker pick-up than other trucks. Three times the vehicle, towing an antitank gun, accompanied the battery on a horse march. Rate of march was 5.7 miles per hour; distance varied from 19 to 28 miles. The vehicle kept right behind the column and moved at the same speed as the animals; it did not march by bounds. In spite of the slow speed, engine tempera. ture did not go above 165 degrees Fahrenheit. On one occasion, because of a small bridge being out, teams and carriages had to leave the road and cut across country to go around the bridge. 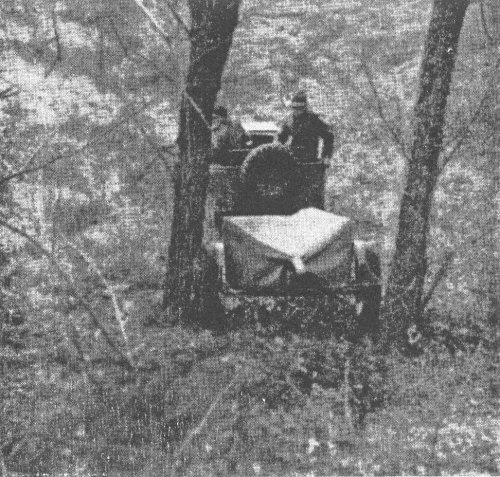 However, the Bantam crossed the creek readily on two planks moved so as to make a track for the wheels. Ruts made by other vehicles do not interfere with movement of this vehicle. Many miles of rutted country road were traversed, both with and without towed load, without difficulty, on frozen and on muddy ground. Because of winter weather, opportunity for extensive tests flotation in soft ground did not exist. However, Squadron for tests, this organization has reported that they are quite satisfied with the vehicle’s performance in mud. 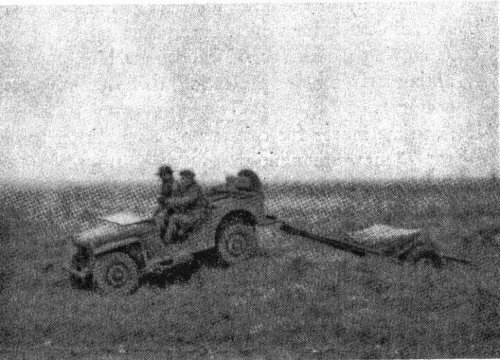 Towing the gun, and carrying 3 men, the vehicle negotiated long distances of deep sand (10 to 12 inches) beside the river in Artillery Park at Fort Riley. In warmer weather, the ground beneath this sand is softer and it is possible that in 15 to 18 inches of soft, dry sand, the vehicle would have difficulty. After the breaking of the rear universal joint, the rear drive shaft was disconnected, and the vehicle driven for several days using front wheel drive only. The cross country and hill climbing ability was decreased by about 60 per cent as a result. 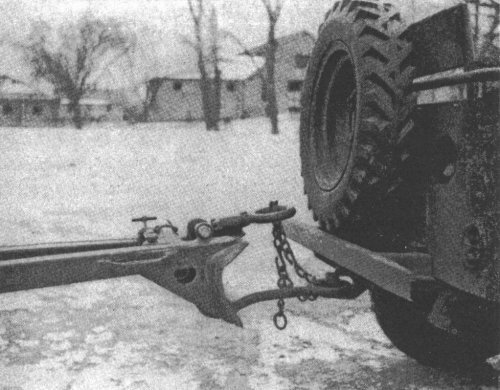 In several instances block and tackle were required to move the vehicle. Three or four men were sufficient to move the vehicle up anything less than a 90% slope. It is believed that, equipped with a light winch, the car could negotiate nearly any terrain, as well as stream crossings of average width. One of the factory-sealed lubricated bearings of the rear universal joint on rear drive shaft had not been lubricated before sealing. The bearing froze and the torque of the drive shaft twisted the universal joint off. Factory replaced universal assembly. The rear axle and differential housing became un- welded from the springs. This allowed the differential housing asscmbly and axle housing to rotate toward the front of the vehicle, thereby cramping the universal joint; and this joint was twisted off. More complete welding remedied this defect. Although not a failure, the welding of the crank case shield to the crank case should be changed so that this shield is bolted to the frame. Prime mover for antitank gun (believed satisfactory). A moving OP for batteries (including a hand operated reel). A vehicle used by Bn CP and Survey parties. A replacement for tricycles and motorcycle with side car. Ammunition carrier for antitank guns. Replacement for the mountain wagon, since the Bantam can carry about the same useful load and is so greatly superior in silhouette, road space, maneuverability, and march ability. Replacement for artillery cart. This vehicle could carry the load of the artillery cart and so would increase draft efficiency of the horse artillery battery. At present, 4 pair are needed to efficiently march and maneuver the artillery reel and cart. The load is out of all proportion to its usefulness and has not the mobility of the other materiel of horse artillery. A radio truck for vehicular radios. A moving mount for .50 caliber machine guns, for antiatrcraft column protection (believed very satis- factory). 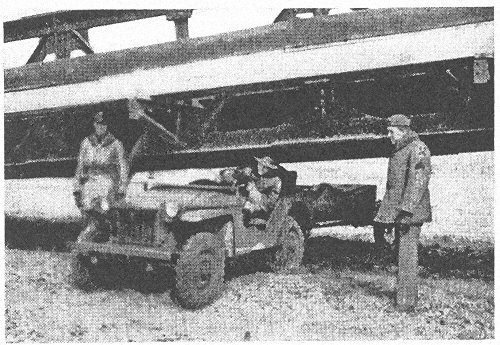 A prime mover for caissons or ammunition trailers for 75-mm. ammunition. A prime mover for 75-mm. howitzer. .50-cal. MG (attack from head of column) Of the above suggested uses, time was not available to determine their practicability; however, reports from the 6th Reconnaissance Squadron state that when fring the .50 caliber machine gun at a halt from the Bantam the accuracy was the same as when using the ground tripod mount, and superior to the present mount on the scout car. Photos illustrate how gun may be served during aircraft attack. The Cavalry Board plan to mount a SCR 245 radio in a Bantam for further test. The silhouette, speed, maneuverability, weight of this vehicle admirably suit it for an unarmored prime mover for antitank guns. 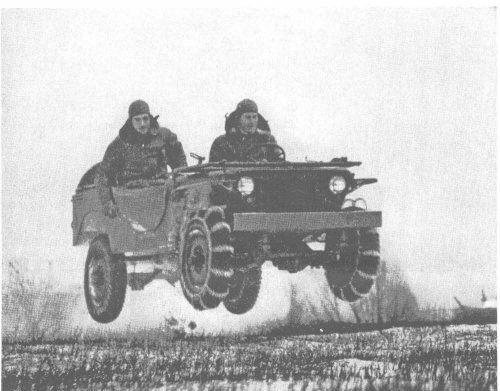 Since those officers conducting the tests were more familiar with the tactical functioning of horse artillery than of truck units, all tests, conclusions, and comments were made primarily with a view to ascertaining the capa- bilities of this vehicle when used with the artillery of a cavalry division.